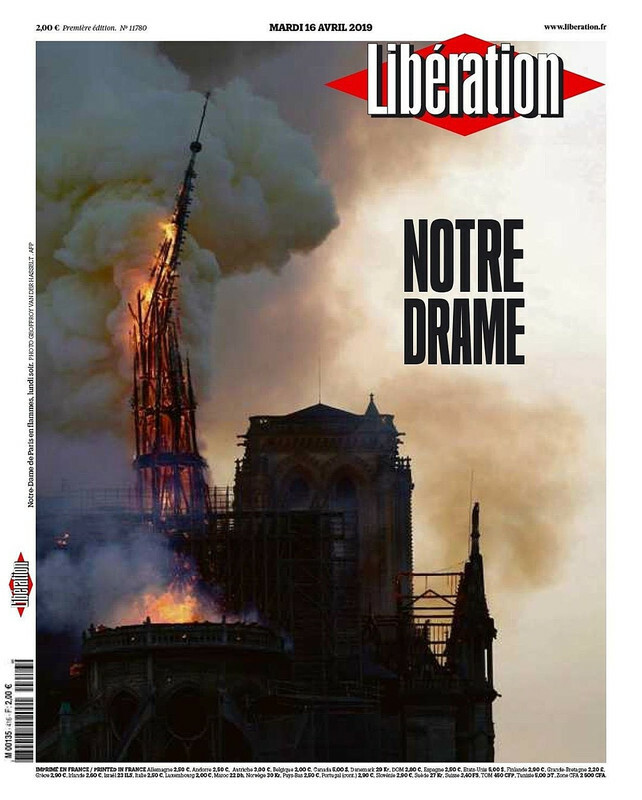 OT: Notre Dame Cathedral on FIRE! Re: OT: Notre Dame Cathedral on FIRE! Truly a sad day for history and mankind. BBC: Main structure saved and preserved. For unknown reasons they never finished these two towers. The fire probably started due to the restoration work being done on the building. It is a tragedy, but it happens. No, the replacement won't be the same (or whatever part needs to be replaced). But they didn't have the will or the funds to keep it up. The way it was built (wood frame, which can get weather and pest damage) contributed it to the fire and maybe made full restoration difficult in the first place. It won't be the same, but whatever they manage to reconstruct will make people feel better if they can recreate all the elements. There are stained glass artisans who will welcome the work. The artwork is the biggest loss. According to media - the towers and facade have been saved and Macron has promised everything will be rebuilt. Not the same, but it will be like a monument of the fire disaster and the strength of rebuilding the church. Seems to be related to an ongoing renovation. Tragic loss. I hope that’s exactly how this disaster started and not some evil deed which we have seem far to many of the past few decades. No Human loss is a plus and I’m sure France will be strong and rebuild. the structure will be saved, and then the inside will need to be strengthened. the inside woodwork dates back to the 13th century, so cant be safe. all of it wont be the same, but the important parts will. Thankfully no one has died or been injured - at least none reported yet. 1 fireman injured, but no reports of it being serious. Deepest respect to the Firefighters! Vive la France! I cried a bit when I got the news fairly late. This is not just a loss for France, this is a loss for the whole world. I hope that the books and manuscripts were all scanned in and the whole building was laser scanned. They should rebuild it like new using the same wood, but it will be better with technology. It will probably take 10 years. It just has to come back and be the same building. <SNIP> They should rebuild it like new using the same wood, but it will be better with technology. It will probably take 10 years. It just has to come back and be the same building. I was thinking there will probably be a Nova/National Geographic special on the detailed restoration airing sometime around the 2030 TV season. They should rebuild it like new using the same wood, but it will be better with technology. It will probably take 10 years. It just has to come back and be the same building. For a lot of us posters "2030" sounds scary. I hope to see it come back. Sort of like buying a kitten and being at a point where you wonder if you are going to outlast the cat or if the cat is going to outlast you. Paris' iconic Notre Dame cathedral caught fire today (April 15), a shocking inferno that soon collapsed part of the building's spire. According to the BBC, the cause of the fire was not immediately known, but may have been linked to ongoing renovation work on the building. It's not yet clear how much of the famous twin-towered church that the fire will destroy, but the damage — including to the church's famous stained glass — is apparently extensive. "The temperature in this [fire] might have reached close to 1,700 to 1,900 degrees Fahrenheit (930 to 1,037 degrees Celsius), easily," said Venkatesh Kodur, a professor of civil and environmental engineering at Michigan State University and an expert in structure fires. Glass shatters at about 1,200 F (650 C), Kodur said. This is not the first time that the Notre Dame cathedral has been in dire straits. The cathedral was completed in 1345, the final result of a mind-bogglingly huge construction project that began in 1163. Notre Dame sites on the Seine river, on a spot where a previous cathedral, the Saint-Étienne, had stood for at least 400 years before. When Maurice de Sully was elected bishop of Paris in 1160, he proposed the demolition of Saint-Étienne and the reconstruction of a new cathedral dedicated to the Virgin Mary, according to the official cathedral history. It was an enormous project, involving new urban planning for the entire area. No building makes it 856 years without some ups and downs. Among the low points for Notre Dame was the 17th century. According to National Geographic, the reign of Louis XIV brought dire changes to the cathedral. Original stained-glass windows were replaced with plain glass; a pillar in the main doorway was demolished to widen the opening so carriages could pass through. The French Revolution was even more devastating. 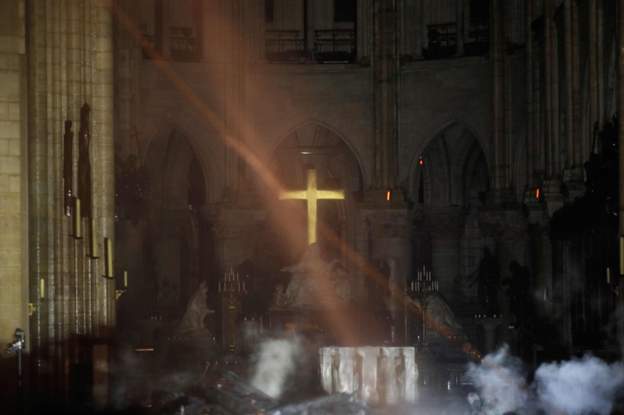 According to the cathedral’s official history, revolutionaries tore down 28 statues of kings housed in Notre Dame, driven by anti-monarchist fervor. They also destroyed many other statues with the exception of one of the Virgin Mary, and tore down the original spire of the church, erected in the 13th century. Revolutionaries renamed Notre Dame the Temple to the Goddess Reason, according to the Fondation Napoleon, and later converted it into a wine warehouse. After the revolution, an agreement called the Concordat of 1801 returned Notre Dame to the Catholic Church. Napoleon Bonaparte, the French general and eventual emperor, chose the damaged cathedral as the site of his 1804 coronation. Bonaparte's people draped fabrics over the Gothic architecture of Notre Dame to make it look like a Greek temple, according to Fondation Napoleon. From then on, the building was used for imperial ceremonies, but remained in disarray until the Romantic movement of the 1800s, according to the Fondation Napoleon. Victor Hugo’s famous novel "The Hunchback of Notre-Dame," published in 1831, reinvigorated interest in the crumbling building in the middle of Paris. With city officials and public support behind him, architect Eugène-Emmanuel Viollet-le-Duc launched a major renovation project to save the cathedral in 1843. It was a 20-year project that created Notre Dame as it appeared before today's fire: The old spire was replaced, sculpted gargoyles were added and new murals were painted. According to the cathedral’s official website, the renovation also included the building of a new sacristy, where priests prepare for worship services, and the reconstruction of the cathedral’s organ. Over the next 150 years, the cathedral would see more facelifts, including the restoration of stained glass in the nave and a decade-long effort to clean the building's western facade. In recent years, the building has again shown its age. Last year, the Friends of Notre-Dame of Paris Foundation launched a major fundraising effort in the United States in an effort to fund repairs to the cathedral. 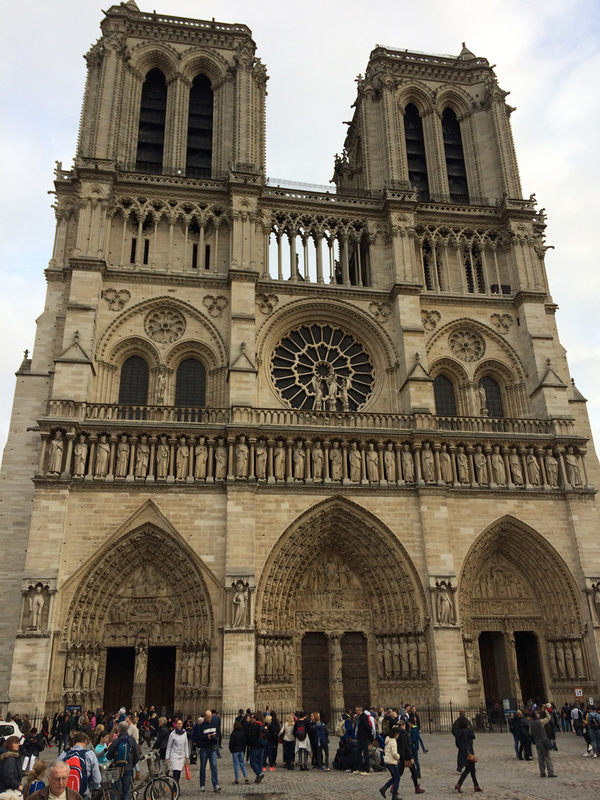 According to CBS News, years of pollution and weathering had cracked the facade and the famous flying buttresses. The French government had pledged $50 million to renovations, but the Archdiocese of Paris had estimated that the total cost would reach $185 million. Most likely, Kodur said, the masonry walls of the cathedral will stand, though they could crack and become weakened from the heat of the fire and the cold water used by firefighters to control the flames. The wooden roof is a loss, Kodur said, as are any drapes, decorations or flammable objects inside. The much-needed renovations may be the cause of the fire that raged at the cathedral yesterday, according to French authorities. But some of the cathedral’s treasures may have been saved by those same renovations, too. On April 11, cranes lifted more than a dozen religious statues off the top of the building to be sent to southwestern France for restoration work, according to the Associated Press. The statues made it down just four days before the fire burst into flame. I still think "2020" sounds pretty scary. Me too . Don't know where years are going ! We need to be guided by the experts in this stuff...but it's a relief to see the masonry still standing. The main thing then required in order to undertake such a mammoth restoration project is the will to do it...and that will surely be there. This is so beautiful. I just had a vision of it recreated with the colors of the universe from the Hubble space telescope. 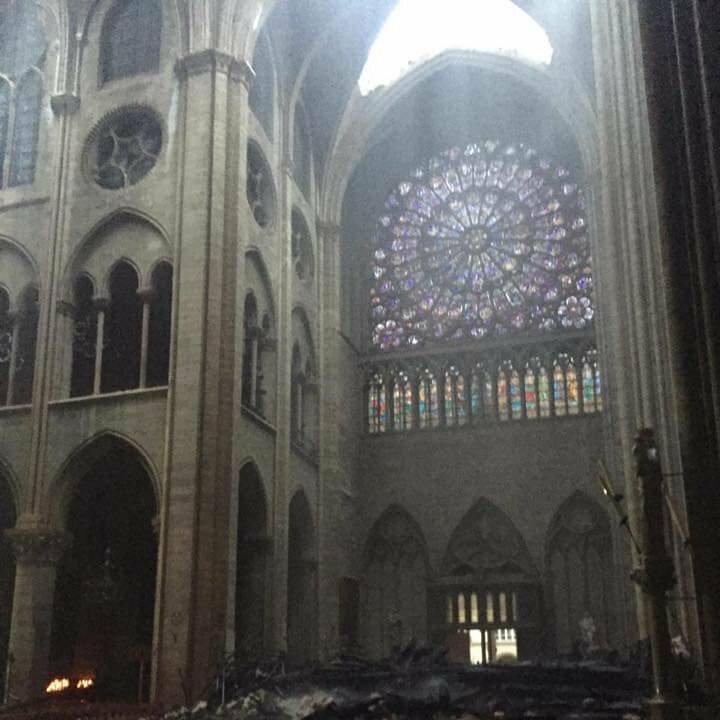 Unfortunately this beautiful and huge stained glass was probably damaged because at this place the vaulted collapsed in many parts. Couple of french billionaires have just vouched 300 mill euros for rebuild! Concert for Notre Dame , may be not the right thing to do or is it? Notre Dame means the world to me. There are things I have experienced there which have made me a better and a more humble man. Last time I was there was the 26th of october 2017. She is the most precious building in the universe for me and I am so sad that I won't be able to show my unborn child how Beautiful she was inside and to try to pass on the wisdom and sprituality which forever were inside those amazing walls. For me, 15th april 2019 the world changed forever. 15/4 1989: The Hillsborough disaster. According to NBC News this morning , Priceless relics of the church and paintings and artwork have been saved including a piece of the crown of thorns that Jesus wore on his head when he was crucified have been saved . May God Bless ! As an English speaking person, what do the words "Notre Dame" mean?